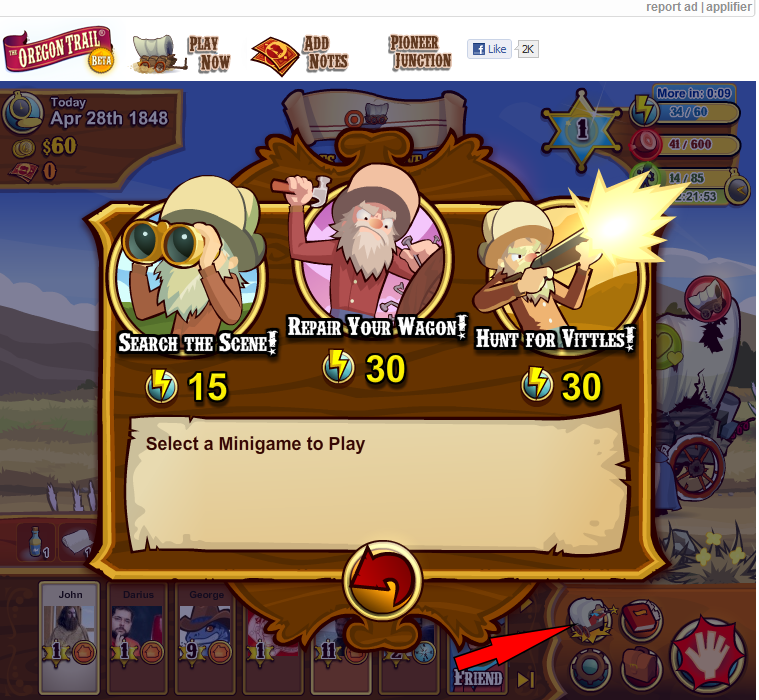 This game allows you to hunt in the area around your wagon to find items you can use. There's no real skill involved other than knowing what can be found, how to use it and where the best places to look are. It's possible to reduce the cost of searching. At the moment this can be as little as 1 energy unit. To do this you'll need the survivalist skins - an explorer only item you can buy for $250 in Oregon City and the spyglass which explorers can buy for 15 Trail Notes by paying the peddler 1 Trail Note to look at his special inventory. You'll need more than one of each! Playing this game earns you 5 XP. This involves a Tetris like game where you have to place patches to repair the wagon. There is skill involved and you'll get better at it with practice. If you complete it in 8 moves, without ovelaps then you'll get 40 repair units. If you do it in 10 moves you'll get 20 repair units. More than 10 patches will earn you 5 repair units. You'll also earn 10 XP for playing this game. It's possible to play this game on behalf of friends who have added you to their team. You get the XP and they get the repair. Click their icon in the list of friends at the bottom of the window to help them. In this game you have to shoot game and collect the meat. 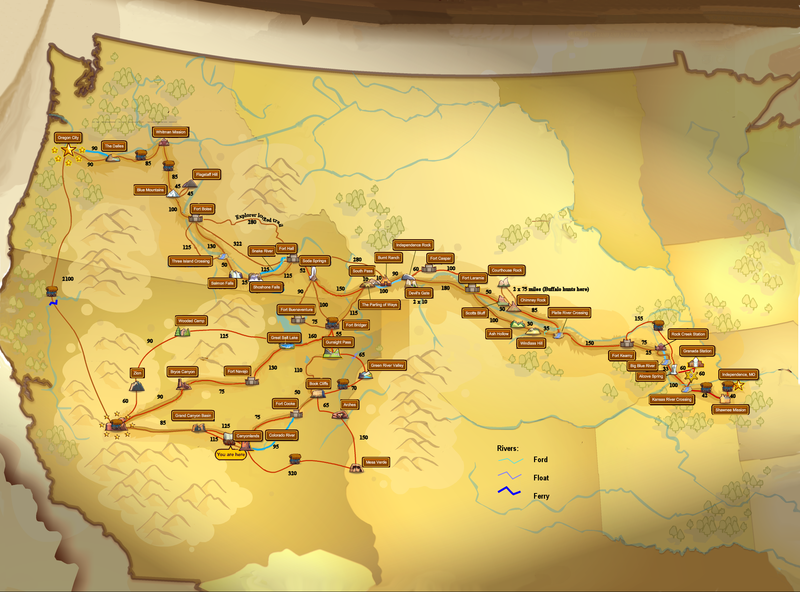 In the first part of the game, Independence to Fort Kearney, you'll find only small game. Squirrels and rabbits. later you'll find bears, coyotes and buffalo. Squirrels and rabbits take 1 shot and won't hurt you. Bison won't attack unless you shoot them. They take 3 shots to kill. Getting the Repeating rifle in Oregon City (7 Trail Notes) makes hunting easier. If you are new to hunting then you would probably be well advised to avoid hunting in a buffalo stampede unless you are desperately short of food. If you do hunt in one kill the first buffalo which appears and ignore the rest. You earn 10 XP for hunting - provided you don't get knocked out. You can also earn XP for hunting for your friends, however, check where they are on the map first. If they are before Fort Kearney it's better to repair their wagon for them. If you hunt as the 'Hunter' you will be able to carry 22lb of meat back to your wagon. The Fur Trapper can carry back 213lb. All other professions get a maximum of 200lb.